We'll Give You A Lifetime Of Free Oil Changes On That Vehicle!" The Brake Shop and Auto Repair has been in business for 22 years and it has been 4 years already at our new location located in Forks Township (4.2 miles north of our previous location). Enjoy our comfortable waiting room with coffee and tv. Our repair bays have been updated to keep with all the new advanced changes taking place in the automotive industry to better serve you. The Brake Shop and Auto Repair is proud to be AAA Approved Auto Repair Facility, NAPA AutoCare Facility, member of the Better Business Bureau and our Local Chamber. We take pride in how our clients are treated and how their vehicles are serviced. We currently have 1 Manager and 3 Technicians on staff with over 70 years of combined automotive repair experience. The staff uses the most up to date technology to service all vehicles. 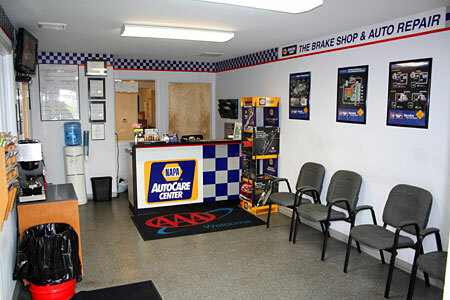 The Brake Shop and Auto Repair is your complete auto repair facility since 1991. Our maintenance program will protect your factory and extended warranty on your vehicle. Here are 5 great reasons to call us . . .
1. WE'LL REPAIR ONLY WHAT IS NECESSARY and advise you of all your options without pressuring you! 3. All of our technicians are certified, so your vehicle will be repaired right the first time. 4. We have the latest state-of-the-art equipment so we can diagnose your problem quickly--and save you money. 5. We'll offer you a ride to and from work or home while we repair your vehicle. Show us your card and save!